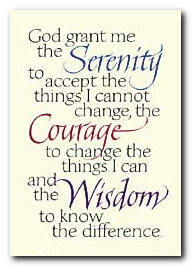 Many of us are familiar with the Serenity Prayer. Most individuals understand there are areas of their lives which they can’t control, as well as areas which are entirely within their control. Thankfully, having the serenity to accept, the courage to change and the wisdom to know the difference might just make the financial journey more enjoyable. 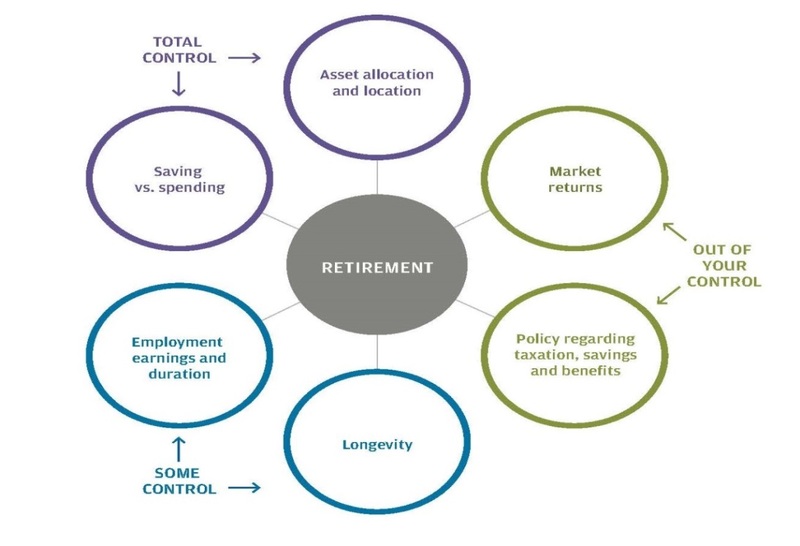 In financial planning, there are aspects which are “known” and entirely in your control. There are also those things which are “assumed”, that may or may not be in your control and that can lead to an uncertain outcome. A well-constructed plan dives into the details of your life, documents the known factors, and makes educated assumptions about what the future might hold and predicts an outcome. Some of the assumptions however, are made in areas that are entirely out of your control and therefore can sometimes seem like a shot in the dark. So what does all of this mean for a secure future? 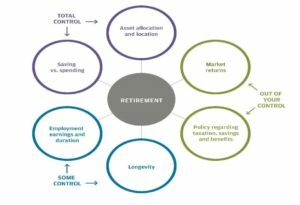 For retirement planning to be most successful, you must distinguish which areas you can control and those you can’t. Recognizing these differences will go a long way to help direct your energies and your efforts in those where you can have the most impact for a successful future. Most individuals have very little if any control over government tax policy and the subsequent laws. Congress regularly changes taxation rules and determines the types and use of savings vehicles available to both individuals and businesses. Although one savings vehicle may benefit you greatly, there is no guarantee you will be able to continue making use of it throughout your working or even retirement years. Eligibility rules may be change, phase-outs implemented, or the tax advantage eliminated entirely. When a new administration takes office or political party achieves a majority, we often hear debate about reforming the entire tax code. When total reform doesn’t happen, small changes might still occur. So what can you do to ease the effect of this “out of control” area? Be well-diversified in the types of savings vehicles you employ to provide maximum flexibility, even if tax rules change. Take advantage of “free money” such as employer contributions in company retirement plans wherever possible. Don’t rely solely on a company retirement plan to provide for your retirement needs. Doing so will mean you pay ordinary income taxes every time you make a distribution in retirement. Save to regular investment accounts, Roth IRA accounts and Health Savings Accounts. When making decisions, consider both immediate and future taxation consequences. Assuming that changes will likely occur in the future, having different buckets of savings which are taxed differently, might provide better options in the future. Understand that markets react to news and sometimes even to the lack of news. They can sometimes swing wildly from day to day for no logical reason. It is imperative you take a longer view and understand if you are well-diversified, there will always be certain holdings that over and under-perform the general markets.When you begin to save for the future, you make decisions about where to invest. If you decide to invest in the markets, the level of risk is reflected through the particular investments chosen. Being narrowly focused with your investments typically puts you at higher risk for loss. Having a well-diversified portfolio with a variety of investments in different asset classes can help reduce your overall risk. Once invested, remember you don’t have control over actual market fluctuations and the resulting returns. Since you can’t control, or predict actual market returns, how do you set the stage for long-term successful investing? Be disciplined and stay invested, even when the markets are choppy. Research suggests that consistently rebalancing to allocation targets, even if counterintuitive, can help long-term returns. Try to resist what behavioral studies show that individuals achieve significantly lower returns than they might otherwise obtain, simply because of bad timing and reactionary moves. Consider using a professional advisor who is bound to the use of an Investment Policy Statement and will be more objective when making changes. As a worker, you often have control over where you work and for how long. You make choices about staying at a particular employer vs. leaving for the competition. You can elect to take a lateral position and gain experience without receiving a bump in earnings. You could choose a more secure employment position while sacrificing future earnings. While your goal may be to continue working until age 65 or 70, you may face unexpected realities such as deteriorating health, family issues or layoffs that can reduce your working years. Therefore, while there are aspects of your employment choices and earnings you can control, there are still aspects you can’t. How can you maximize your lifetime earnings so you will have enough to sustain you throughout retirement? When you are earning a substantial wage, try and live well below that wage and maximize your savings as a means of protecting you against a forced early retirement or other hardship. Protect your income potential against loss through the use of life and disability insurance to protect yourself and to ensure those who are dependent on your income are also protected. Have a different perspective on retirement, viewing it as a time of transition to a different type of work. Your earnings may change dramatically but even small amounts of income during retirement can make a positive difference to the overall picture. When you are attempting to calculate how much you will need for a secure future, part of the unknown is the length of your life. You may be thinking that life expectancy is completely out of your control. While we don’t know what disease or calamity may befall us, there is much we can do to help increase our odds of a long and healthier life. I’ve heard many people say they can’t wait until they retire so they have time to exercise and eat better. While this is an admirable goal, the reality is that by waiting to begin those changes at retirement, their health path may already be predetermined. So, how do you have a positive influence on your longevity? The first step is to begin today to improve your overall health. Get regular checkups and complete the recommended exams for someone your age. Even if disease strikes, early diagnosis can be the key to more positive outcomes. The healthier you are today, the better you will be able to weather the storms in health you may encounter. Therefore, eat healthier, exercise and get enough sleep. These seem like common sense things, but they can make a tremendous difference. Understand that you may live much longer than you think. Visit www.livingto100.com to estimate your life expectancy. This might give you a nudge to begin making positive changes today. No matter what your earning level, you have decisions to make around how much to spend versus how much to save. Once earnings take care of basics like shelter, food and clothing, you can then make choices about what to do with excess cash. You might ramp up your style of living, such that more and more of your earnings are consumed maintaining that lifestyle. You may also choose to increase your savings for retirement, trips, or education. Every time income changes, you are faced with the same choice to save or spend so how can you make the decision to save more automatic? Set goals for saving levels and pay yourself first. If cash comes out of your paycheck and in to a savings account before it hits your checking account, you are more likely to leave it there. When you receive a salary increase, change your savings to match and make it take effect at the same time. You won’t notice a difference because what goes in your checking account hasn’t changed, but you will be saving at a higher level. When choosing where to put your savings, the number of destinations is virtually endless. Some provide current tax savings, some future tax advantages, and some are restricted for medical or educational expenses. Some are matched by your employer, while some are guaranteed by insurance. Access to savings can be restricted or freely withdrawn at your local ATM. It is important to think about where your assets live not only today, but how much flexibility those locations will provide in the future. How can you know what the best strategy is for your situation?Deciding how much risk to expose your savings to is a big decision. Savings can be kept in FDIC-insured accounts, where they will grow very slowly but remain very safe. Savings can also be placed in risky investments which have the potential for higher returns. Better returns are always welcome but they may also come with wild swings in value and possible losses. The level of risk and the variety of investments are things you can control and that can help to shape outcomes in markets that can’t be reliably predicted. Be well-diversified with different types of investments so that everything isn’t moving in the same direction at the same time. Diversification IS NOT having a mutual fund at multiple custodians, since those funds you own might all concentrate solely on small U.S. companies. Diversification is having holdings which represent different sized companies, different sectors of the economy, different areas of the world and that act differently depending on various economic factors. Understand the amount of risk you can tolerate in the portfolio. Allocation is responsible for roughly 90% of portfolio returns, so getting this right is a key consideration. A risk profile should be driven by your ability to handle typical market swings, not by your need to make up for lost time. Talk with a professional to understand the nuances of where your assets should live based on your tolerance for risk. A combination of investment types and account types can be effective in providing you with maximum flexibility for the future. By this point, you are probably feeling the need for the Serenity Prayer. Your financial future can be bright if you understand which areas you have total control over, which you have some control over and where you need to be diligent in keeping watch because you have no control. Focus your efforts on the areas where you can have the most impact and look to professionals to assist you with the changing landscape in the areas you can’t control, thereby gaining wisdom along the way.